Príomhchathair agus an chathair is mó i stát Queensland, An Astráil is ea Brisbane. Tá Brisbane suite in oirdheisceart an stáit, an réigiún is mó fás sa tír. Le daonra 1.8 milliún duine sa bhliain 2005, is é Brisbane an tríú cathair is mó sa tír de réir daonra, tar éis Sydney agus Melbourne. 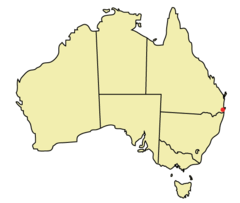 ↑ (Béarla) "Climate statistics for Australian locations - Brisbane Regional Office", Bureau of Meteorology (20 Eanáir, 2011). Tugadh an leathanach seo cothrom le dáta an 16 Iúil 2017 ag 22:05.